At the time, Transformers: The Movie was notable for two things. One was the fact it killed everybody, traumatising an entire generation of young, impressionable movie-goers. The second, and more lasting, was the movie's casting. It was a mess. A glorious, haphazard mess. There were teen heartthrobs, oscar-winning actors, sci-fi staples, comedians, TV veterans, voice-over people, the works. Yet somehow the "throw as many random names as we can afford" approach actually worked, and better still, it made the flick memorable. Example? I once won a pub trivia night by successfully answering the question "What was Orson Welles' last ever movie". With Mass Effect 3's cast assembled earlier today, it struck us how much BioWare's series had begun to take after Transformers' batshit crazy approach. That with each game came an increase in the size of not just the cast itself, but how bonkers it was. Where Transformers went the "elder statesman" route with Orson Welles, Mass Effect has Martin Sheen. 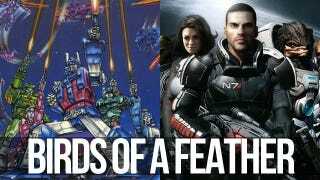 Where Transformers hired a veteran voice man in Robert Stack, Mass Effect has veteran voice man Keith David. Transformers had sci-fi staple Leonard Nimoy, Mass Effect went and hired half the cast of Battlestar Galactica. Transformers had Monty Python comedian Eric Idle unexpectedly voice a role, Mass Effect went deep into left field and hired funny man Seth Green to play not a teenage loser, but a starship pilot. And where Transformers shot for the swoon vote with Judd Nelson, fresh off Breakfast Club, Mass Effect now has...Jessica Chobot. Now, I'm not saying Mass Effect is copying Transformers. It's just, we noticed this morning that the Chobot hire had tipped the movie over the edge. For over 25 years, Transformers has stood at the pinnacle of crazy nerd sci-fi casting. Nothing came close to assembling such a talented, yet bizarre cast of talent. But if Mass Effect 3's new hirings don't completely ruin the mix, it may have a little competition from a cast that includes a former President of the United States, a star of They Live and a girl who licked a PSP that one time.